Bonnie Slotnick has a website, but she discourages her customers from using e-mail. She’d prefer to speak to them directly. She rarely cooks in the compact kitchen of her circa-1892 New York apartment, yet each day, she is surrounded by nearly four thousand cookbooks. 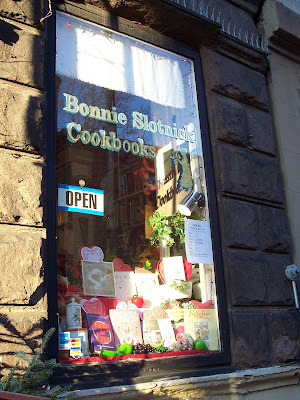 What might appear to be curious contradictions in an era of web-based businesses and instant search results are quickly dispelled during a visit to Bonnie Slotnick Cookbooks at 163 West Tenth Street in New York’s Greenwich Village. The experience is like a journey back in time. It is a bitterly cold day in Manhattan, but a whimsical early-Valentine’s Day window display of red paper-doily hearts and cookbooks on food and love beckons visitors to enter the town house. Inside the narrow shop, tidy white shelves hold a plethora of cookbooks from floor to ceiling. Sections are neatly labeled according to categories – Regional Cooking, Children’s Cookbooks, Household Manuals, Holidays, Cocktail Guides, or James Beard. There is a smattering of antique kitchen gadgets and utensils and bric-a-brac throughout the shop. Bonnie Slotnick is a slender, soft-spoken woman. Her words are underscored with fluid, graceful hand movements that convey a sense of gentle elegance. She describes her inventory as vintage cookbooks and ephemera, which is the word typically used for something short-lived and without lasting significance. Yet, she quickly clarifies that the term is really a misnomer in her mind when it comes to her collection. She spent 16 years in cookbook publishing, and over time, honed her skills as a “book searcher,” someone adept at tracking down rare editions. She opened her New York store on West 10th Street just off of 7th Avenue South in 1997. I have just finished a leisurely browse through the shop, and carry three treasures to the front desk – a 1928 edition of The Boston Cooking-School Cookbook by Fannie Farmer, a 1969 facsimile edition of Mrs. Beeton’s Book of Household Management, and a book from the 1970s titled Recipes from America’s Restored Villages. I ask Bonnie if she recalls her first cookbook. I mention my favorite book from childhood, Betty Crocker’s New Boy’s and Girls Cookbook. “That’s the one with yellow stripes,” she notes immediately. 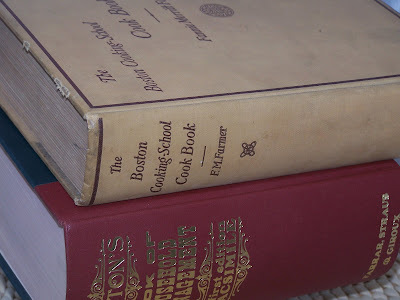 Bonnie personally tends to gravitate towards 19th century American and English cookbooks of the period 1850 to 1950 – “books without dust jackets.” She points out that as she began to collect, she wasn’t necessarily doing so for the recipes. “I love reading the recipes, but in the period that attracts me, the recipes aren’t all that attractive.” Indeed, she notes that most cookbooks of that period advocated the systematic overcooking of vegetables. 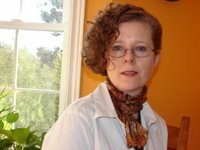 I ask her if she knows the answer to my father’s favorite question – “Why are so many of us are addicted to cookbooks?” She smiles, and talks about how people are drawn to cookbooks for different reasons. One might buy a modern cookbook for a specific recipe, while someone else will buy a vintage cookbook because of the memories they inspire. What is it that draws her customers to her collection? “They like where the books take them. Maybe an older book takes them back to their grandmother’s kitchen.” In a large, often impersonal city like New York those kinds of associations can be important. 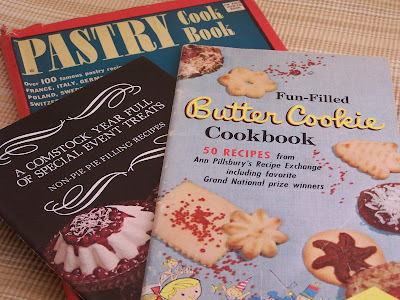 “They [vintage cookbooks] represent some kind of comfort and security,” Bonnie responds. Bonnie recommends taking pictures of your cookbooks, especially if you have a large collection. She talks about customers who have lost significant collections in fires, and have then had difficulty reconstructing their collections from memory. She shows me a lower shelf lined with boxes that are stuffed with food company promotional cookbooks. “My friend calls these cookbooklets,” she laughs. She opens a box that contains dozens, ranging from Chocolate to Cheese. She is quite taken by the evocative illustrations and photography. The small booklets seem to carry a Proust-like ability to conjure up sentimental memories for her. As we conclude our conversation, two women are preparing to leave the shop. They have not made a single purchase, but they are clearly delighted. “It’s just so much fun in here,” one woman enthuses. Upon hearing the comment, Bonnie gives me a contented smile. That is exactly the reason she collects cookbooks. I wish I could visit that place. I'm always on the search for old cookbooks. I have a few right now that I would not trade for anything. To me old cookbooks are so precious. I have many old cookbooks myself, but only as far back as the 70's when I started my own collection.There are so many classic recipes that will never be forgotten and are revamped every day! One of the two most dangerous stores in New York (Kitchen Arts & Letters is the other)! How did you manage to escape with only three books? Now, if you are ever up in the Providence area, I will take you to my own secret used cookbook store, one which has no web site at all -- Eagle Trading Company in Assonet, Mass., a very out-of-the-way little village. But don't tell anyone. What a beautiful post! I miss this place since I moved to Seattle, but happily I'm headed to NYC tomorrow for the next 10 days so am looking forward to visiting! So T.W., how many cookbooks do you have? As for me , I stopped counting at 50. I think I'm addicted to cookbooks because I always think that there is something new to learn. i *love* this store. it's dangerous for me to enter, along with kitchen arts & letters (and the strand, for non-food books). Helene - I agree that old cookbooks capture distinct moments in time. Bellini - I really like the look of the cookbooks from the 70s, which was when I really began cooking in earnest. Lydia - Eagle Trading Company sounds like a wonderful place. I will have to visit! 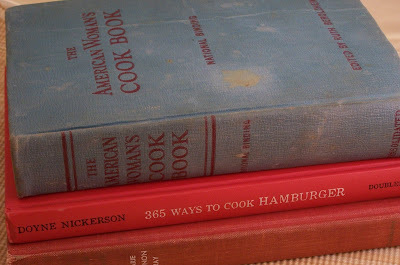 Maryann - I often curl up with a cookbook before bed - I like books on food history as well. Louise - I will have to check out Kitchen Arts and Letters. Cakespy - Let me know what you buy! Veron - I have never done an actual inventory, but I can tell you the only room in my house where you will not find cookbooks is in the bathroom! Thursdaynight - Thanks for visiting! I was in the Strand at Christmas, and could have spent a month there! Thank you for your reminder that I need to visit this store next time I'm visiting NY. I'm not quite sure how I've forgotten it on my previous visits. And for some reason I thought it had been open longer. I'm glad to find out I hadn't been overlooking it for as long as I'd thought. I am going to have to get to this store next time I am in NYC (this summer) visiting family. I grew up in NYC, lots of family out on the Island, and have been collecting old cookbooks since the late seventies (along with my mother, whose collection I inherited). Love your site and look forward to reading your archives. Am going to go link you right now! Hi Lidian - thanks so much for visiting. I've taken a look at your site, and you would REALLY enjoy Bonnie's shop! Hello fellow vintage cookbook collector. I was searching Blog Land for kindred spirits & found you. 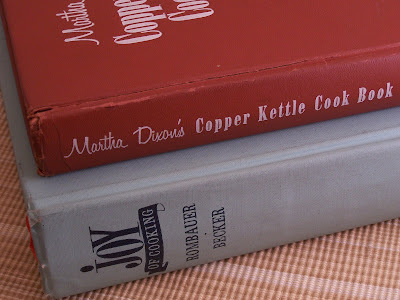 My blog is a hodge podge of many things, but I've blogged a lot recently about vintage cookbooks & modernizing the recipes. Stop by sometime.